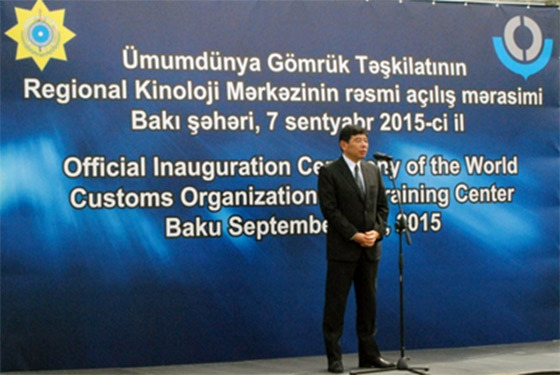 Official opening ceremony of the World Customs Organization’s (WCO) Regional Canine Training Center was held in Baku on September 7. 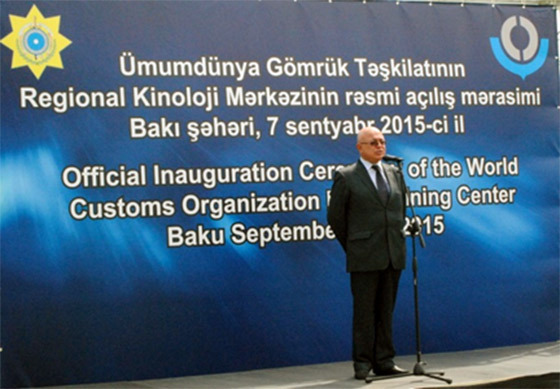 Chairman of the State Customs Committee of the Republic of Azerbaijan, customs service Lieutenant-General Aydin Aliyev and Secretary General of the World Customs Organization Kunio Mikuriya attended the ceremony. Chairman of the State Customs Committee Aydin Aliyev said that Canine Training Center of the State Customs Committee of the Republic of Azerbaijan, which was established 20 years ago, became one of the important structures of the customs service. A number of large-scaled operations were held here with the help of dogs, a great deal of drugs, explosives etc. were seized. Chairman of the Committee said canine trainers from some of the WCO member states attended trainings here, the dogs trained at the center were donated to the customs bodies of a number of countries. Up to now the dogs trained by Azerbaijan’s Customs Service have been donated to the customs bodies of Mongolia, Togo, Bulgaria, Macedonia, Turkey, Georgia, Afghanistan and other countries. The dogs trained at the Canine Training Center won various competitions several times. Aydin Aliyev added that taking into account the work done, the World Customs Organization gave the status of Regional Canine Training Center to the Canine Training Center of the State Customs Committee. 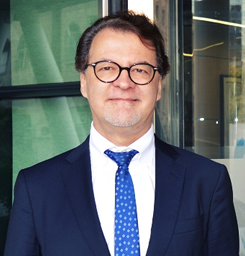 Secretary General of the World Customs Organization Kunio Mikuriya said customs service, which previously contributed to economic growth, also plays an important role in border management. Secretary General said well-trained dogs were important in order to cope with this task. Kunio Mikuriya also stressed the importance of the activity of the Canine Training Center of the State Customs Committee of the Republic of Azerbaijan, the work done in the field of international relations, contributions to the global customs officers family. Trainers of customs services of Azerbaijan, Argentina, Turkey, Kazakhstan, Kyrgyzstan, Russia, Uzbekistan and Georgia attended the ceremony. Certificates were given to the teams that demonstrated their skills at the training field of the Canine Training Center. 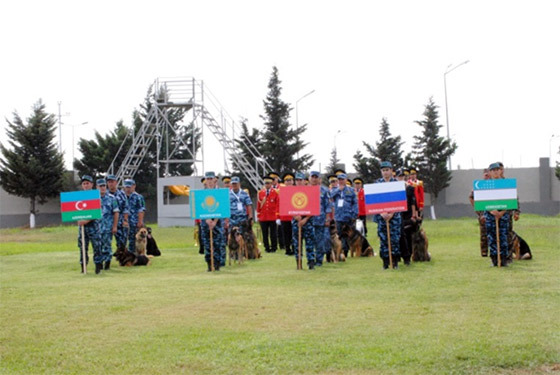 2 dogs trained in Azerbaijan were donated to the representatives of Gabonese Customs Service. On September 7, a ceremony was also held at the Academy of the State Customs Committee of the Republic of Azerbaijan to sign an Action Plan. The document on the cooperation in science and education was signed between the Academy of the State Customs Committee of the Republic of Azerbaijan and Department of Customs and Excise of the University of Muenster of the Federal Republic of Germany. It should be noted that demonstration of the teams composed of dog trainers from some WCO member states and service dogs will be held at WCO Regional Canine Training Center in Baku, the 5th all-around competition of canine training agencies of customs services of the CIS member states will start on September 8.